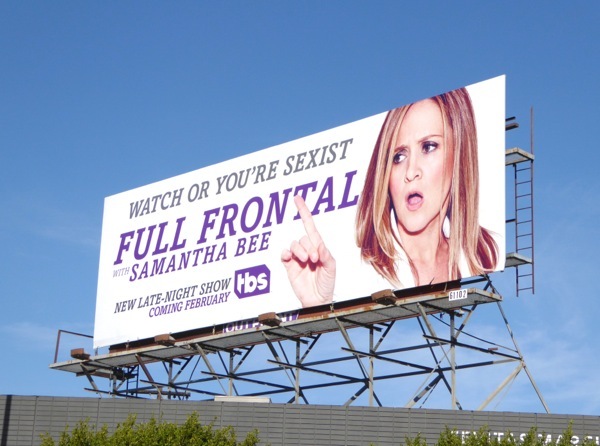 There's nothing like a bold Full Frontal billboard to start a new month here at Daily Billboard, and these one's are courtesy of Samantha Bee's new late-night TBS show. The comic and former long-running correspondent for The Daily Show with Jon Stewart will be TV's only female late-night host, dipping her toe into what has become very much a boys club since the departure of Chelsea Handler in 2014. That makes her ad creative's tagline, 'watch or you're sexist', even more poignant. Also anyone who can rile up the conservative hate group, One Million Moms (which actually boasts a membership of far less actual people), simply over the title of her show before it even airs is okay in our book. 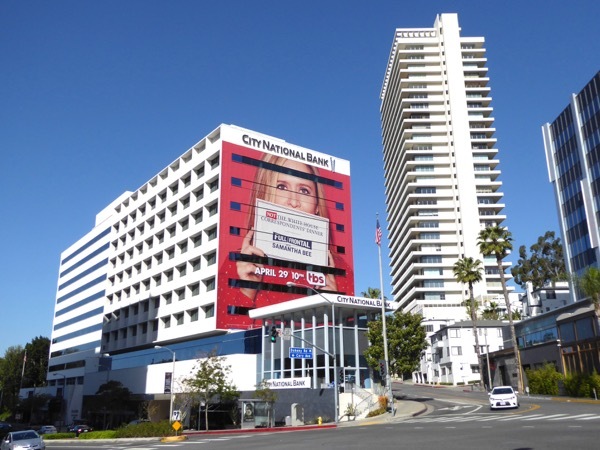 The landscape billboard was first snapped along La Cienega Boulevard on December 23, 2015, whilst the giant-sized version was photographed on the eastbound side of the Andaz Hotel along the Sunset Strip on January 21, 2016. Watch out guys, there's a new Full Frontal force taking on late-night satire, so maybe it's time to up your game or simply get out of the way. UPDATED: This season Samantha Bee has certainly disrupted the late-night boys club with her take on the political landscape and topical issues like gun control. 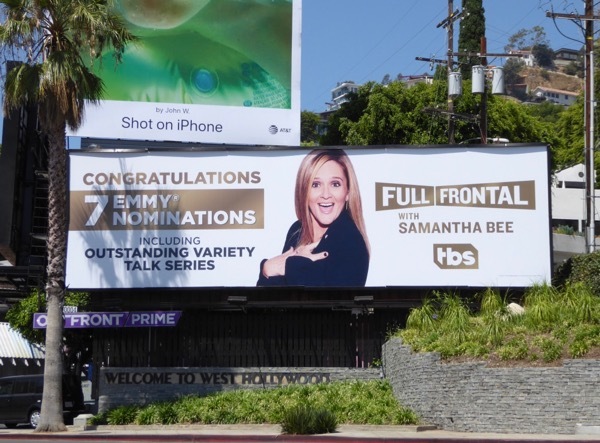 Let's see if her satirical insights can garner Full Frontal some Emmy nominations this year, with the help of this eye-catching consideration billboard snapped along Olympic Boulevard on June 22, 2016. 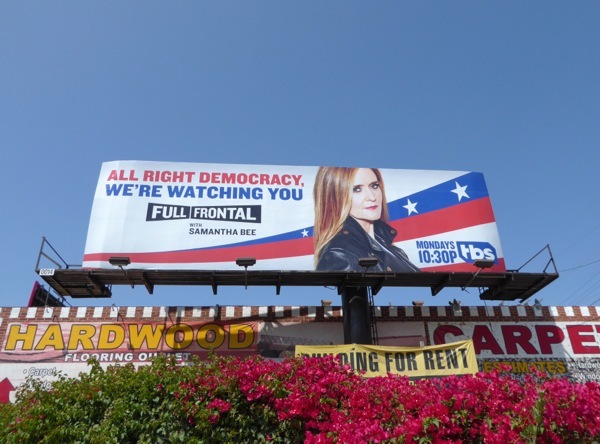 UPDATED: Samantha Bee may have been snubbed by the Emmys herself this year (although the show did receive a nomination for writing), but as a consolation prize she gets an extra patriotic billboard just before the Republican and Democratic conventions kick off. 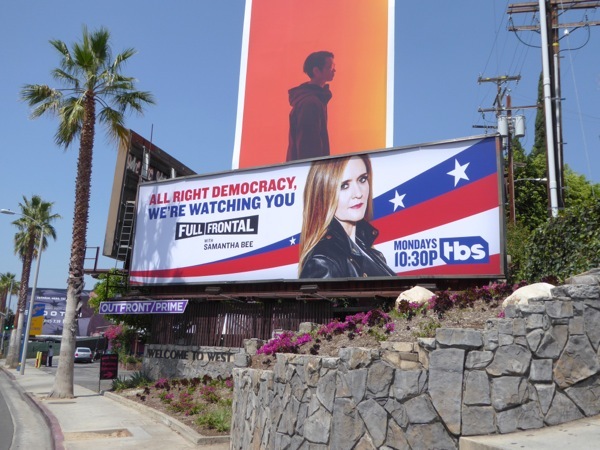 This timely 'All right democracy we're watching you' billboard for her Full Frontal show was photographed along the Sunset Strip in West Hollywood on July 15, 2016. Plus here's another less obscured billboard snapped along La Cienega Boulevard at Fairfax Avenue on August 5, 2016. UPDATED: In these days of madness with Donald Trump in the White House, Rachel Maddow and Samantha Bee are two ladies that keep us all sane with their facts, investigative journalism and political satire. And as the current administration is at war with the media on a daily basis, Full Frontal with Samantha Bee will host its own 'Not the White House Correspondents' Dinner' which will take place the same evening as the other glittering gala affair. 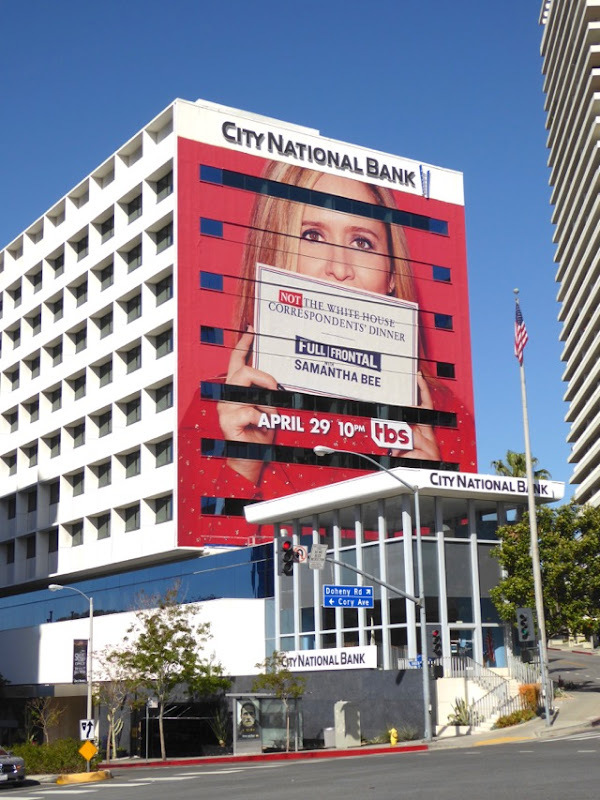 This bold red billboard invite to the TBS comedy special was photographed along West Hollywood's Sunset Strip on April 15, 2017. UPDATED: Samantha Bee was also getting super-sized with the hope of garnering some Emmy nominations this award season. 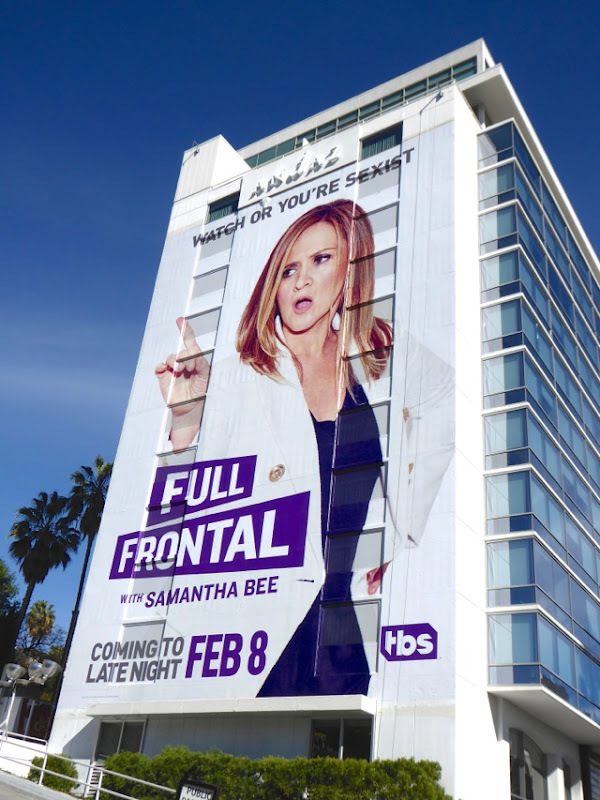 This giant 'For your consideration' billboard for Full Frontal and its satirically funny female host were photographed on the side of West Hollywood's Andaz Hotel along the Sunset Strip on May 22, 2017. 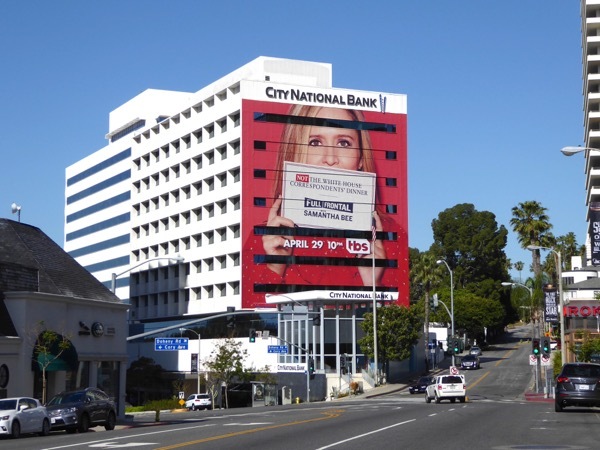 Plus this additional landscape billboard was spied further west along Sunset Boulevard on June 2, 2017. UPDATED: It looks like all the hard work and Emmy campaigning paid off for Samantha Bee this year with her show and her Not the White House Correspondents Dinner special securing seven Emmy nominations between them. 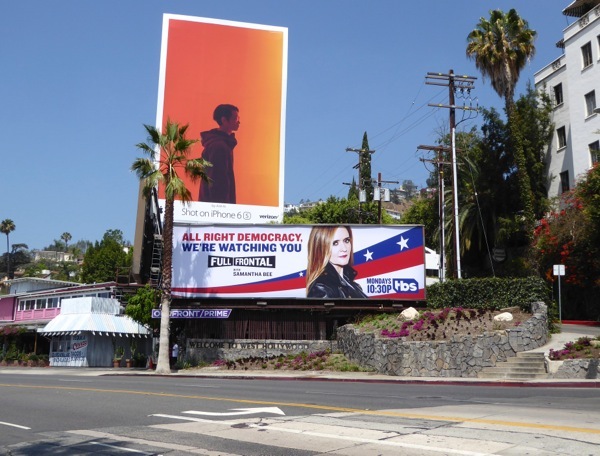 This celebratory nominations billboard was snapped along the Sunset Strip on August 14, 2017.